Originally called 'The Hill' on Philip Byles map of 1653, by Victorian times this long, narrow yet very steep field in the extreme northeast corner of Yeovil was known as Linches (Parcel 894) and the 1846 Tithe Apportionment recorded its area as 7a 1r 0p. Its use was recorded as pasture for grazing livestock and at its extreme northern end had a short boundary with the River Yeo so that the livestock could find water. The name Linches derives from the Old English hlinc meaning ridges or terraces on sloping land. A lynchet, from the same root word, is a bank of earth that builds up on the downslope of a field ploughed over a long period of time. Tapering to a point in the south, it was bounded in the east by Great Mead (893) and in the west by Twenty Acres (895) and Nine Acres (894). Today, because of its steepness, it remains one of the very few Yeovil fields to survive, albeit pretty much as waste ground - hopefully its incline will prevent it being built on by the ever-encroaching Wyndham Park. 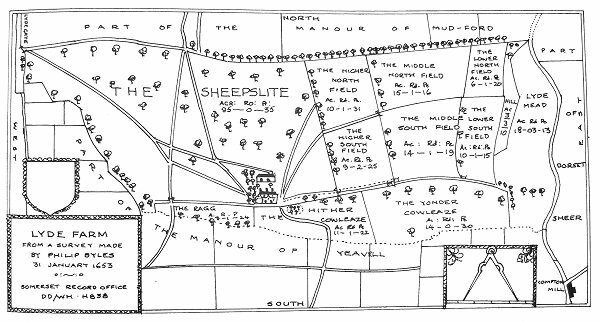 Philip Byles' map of Lyde Farm dated 31 January 1653. The Lyde area reproduced from the 1842 Tithe Map with Linches towards extreme right. The 1946 aerial photograph of Great Lyde Farm. A Google Earth view of Great Mead at centre, looking west. The River Yeo runs along the bottom of the photograph and Linches (894) is the steep, rough ground to its immediate west. 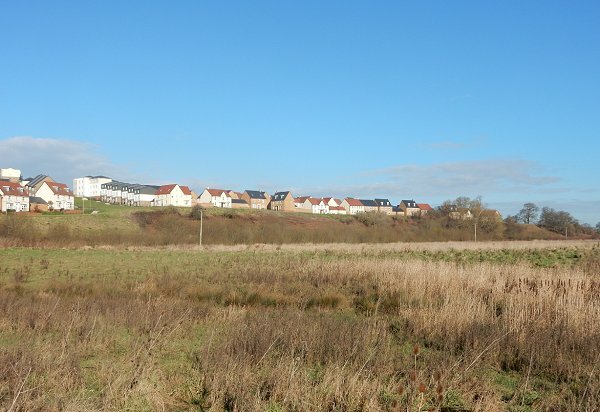 Beyond that, from left to right, are the gas-venting buildings on the site of Spear Bed (908), the remnants of Lower Cowleaze (907), Nine Acres (906) and Twenty Acres (895). Linches photographed from Great Mead. The houses of Wyndham Park line up along the edge of Linches, which is nothing more than a long, steep bank covered in bushes and undergrowth. Photographed in February 2016. .... and photographed from a passing train in July 2016.